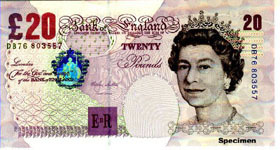 I just came back from a trip to the UK and found that the old style 20 pound note (series E) is not valid currency anymore. Banks will exchange them for you, but only on their terms, which usually include the need for an account to deposit the money. They will however accept the old style notes if you want to buy foreign money (like €€€). So be warned, and get your old money out. Apparently the new GBP 20 note has been in use since 2007 and although I have been in the UK a few times the past few years, I still had some old notes, which gave me some UNC R/X at a bank in Uxbridge. It happened to me in July 2010 as well. I remember standing in a small British model railway shop in Eastbourne , being ready to pay a sum of GBP 32,50. I had two old type 20pound notes with me, handed them over and received an: "They are not valid anymore. Since July 1st you can only pay with the new ones. But there is a bank up the road, they`ll change there." (I wanted to pay on July 4th ) Fortunately, I had some other notes ith me and paid. Then, I went into the small bank (NatWest) said to the woman at the counter "I heard, these notes are not valid anymore...", gave them to her and received new ones, without any problems. I was not asked whether I had a bank account, nothing. Maybe this has changed, but I did not have any problems.